It’s the middle of the month and that means it’s time for a new challenge at Copic Marker Norge. As usual, this year, the theme is anything goes, but this time the DT has been challenged to make the background with Copics. I decided on a simple sky and brick wall. 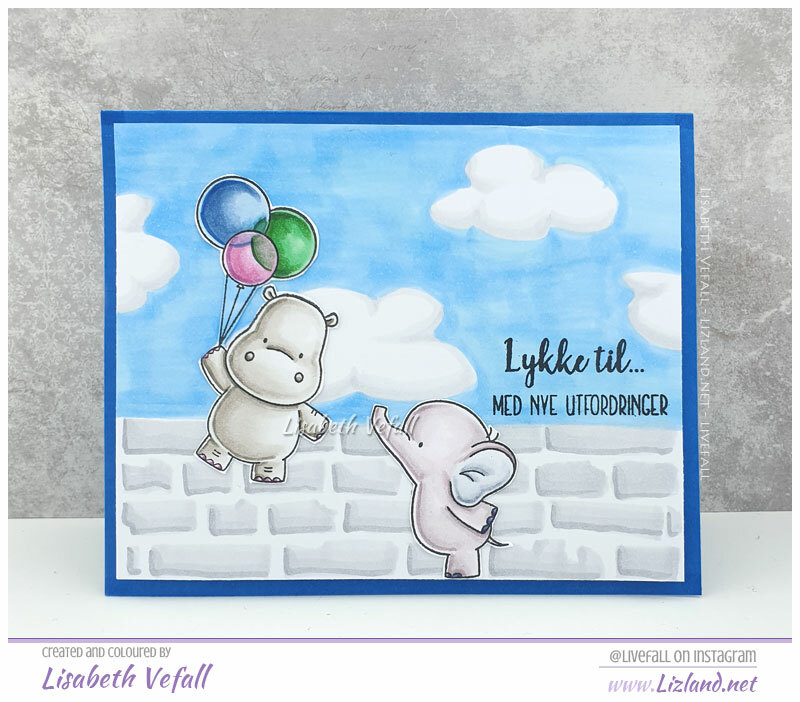 The two animals stamps are by MFT Stamps and the sentiment is by Huldra Designstudio. 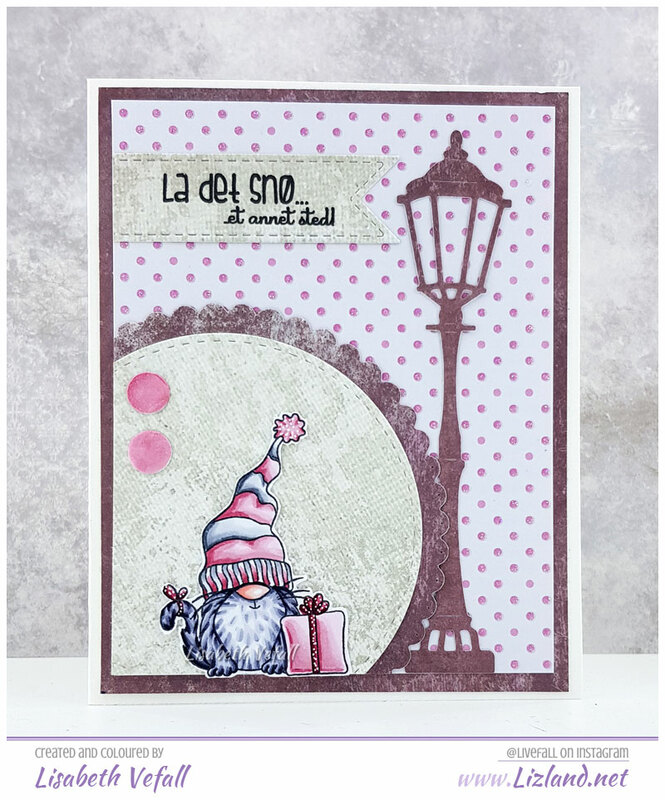 I’ve made a pink Christmas card with an adorable cat from Huldra Designstudio, and some La-La Land Craft dies. Kept it rather simple. Jeg har laget et kort med langnisseluekattstempelet til Huldra Designstudio. Du finner både den og tekststempelet på stempelplata Julekatt og Julehund. 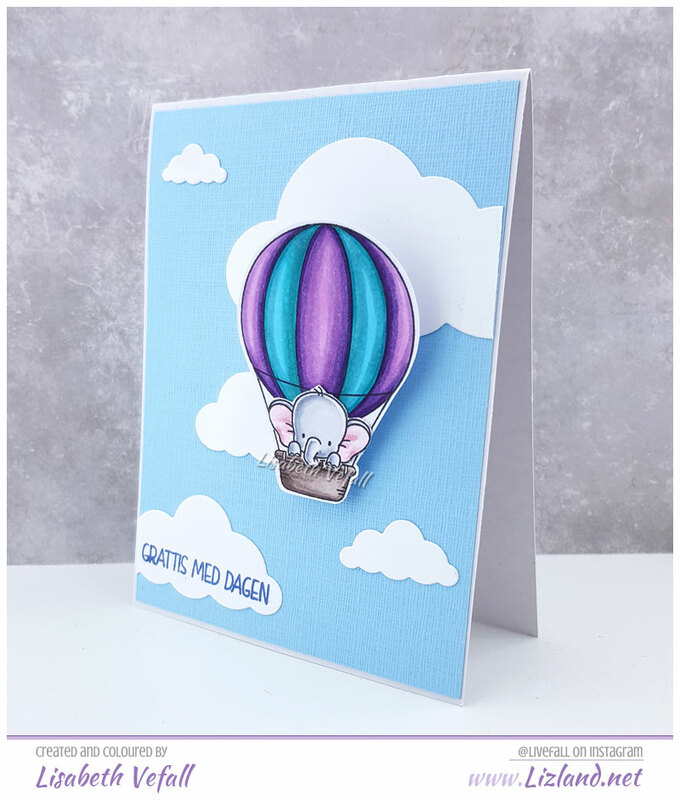 Dies er fra La-La Land Crafts. Et raskt og enkelt kort, enkelt og greit. A close-up of the text stamp. A close-up of the cat and colouring. Et nærbilde av katten og fargeleggingen. Copics used: BV20, BV23, BV25, BV29, RV00, R81, R83, R85, R39, C1, C3, C5, R20, R22 + white Sakura gelly roll 08. Today I’ve got three projects to share with you. 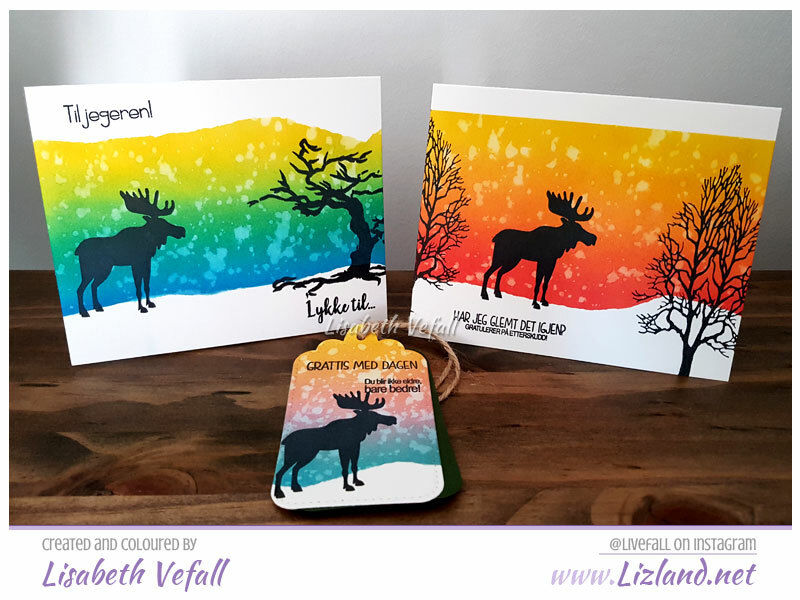 All of them are featuring Distress Oxide Ink, text sentiments in Norwegian and the same elk/moose stamp from Huldra Designstudio. I asked for suggestions for the background colours and as I got four suggestions I thought I may as well try to use them all! All of the projects are made with everything on just one layer, except for the tag that has another tag in green on the other side. I dag har jeg tre nye prosjekter å vise dere. Alle er laget med Distress Oxide, tekststempler og det samme elg-stempelet. Det er da selvfølgelig Huldra Designstudiostempler jeg har brukt her. Jeg ba om fargeforslag på Facebooksiden til Huldra og fikk inn 4 forslag. Siden det ikke var så mange så prøvde jeg å lage kort med alle. Det er stempelplata Jakt som har vært utgangspunktet for disse. Alle prosjektene er laget med kun ett lag, med unntak av pakkelappen som har enda en pakkelapp i grønn på baksiden. 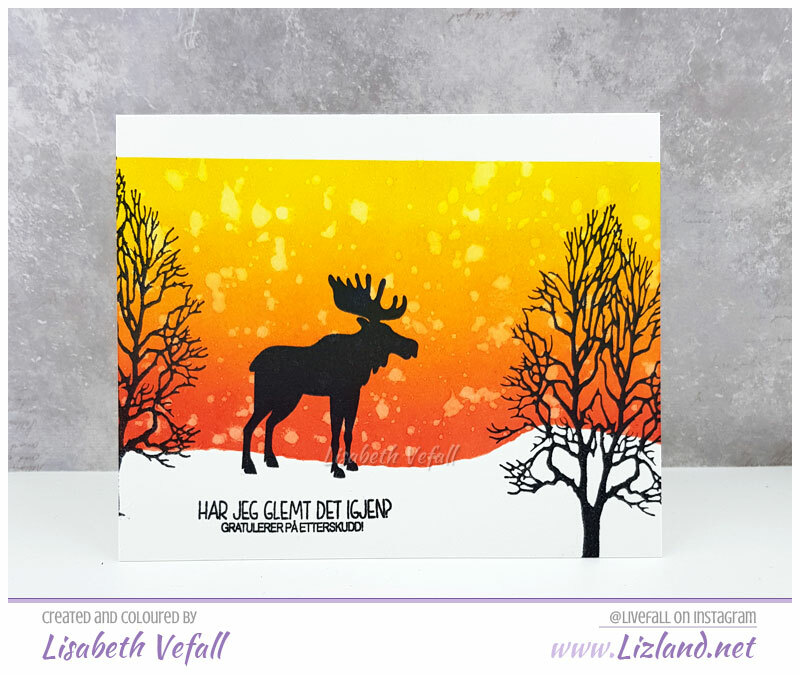 The first card is made with the colours yellow-orange-red and a tree stamp by Nelli Snellen. Det første kortet er laget med tre Distress Oxide farger. Gul – oransje – rød. Trestempelet er fra Nelli Snellen og tekststempelet er fra stempelplata til Huldras Rampestreker. 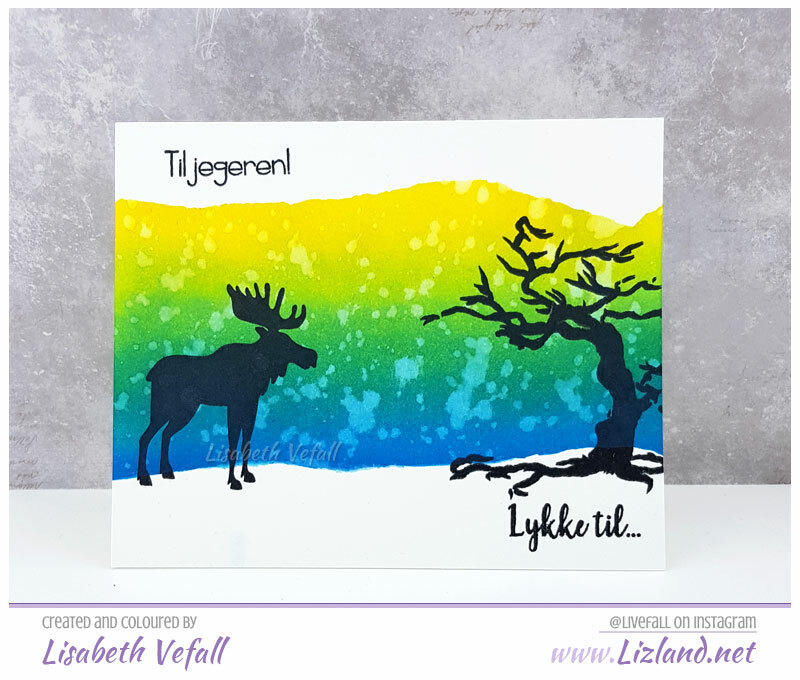 The second card is made with yellow-green-blue and a tree stamp from Altenew. Dagens andre kort er laget med forslaget gul-grønn-blå og trestempel fra Altenew. Her er tekststemplene fra stempelplatene Jakt og Fleksitekst. Here is the tag I made. The colour suggestions was yellow-pink-turquoise as well as yellow-orange-pink-blue(x2). The tag die is by La-La Land Crafts. Pakkelappen jeg har laget er med fargeforslagene gul-rosa-blågrønn og gul-oransje-rosa-blå(x2). Teksten her er også fra Rampestreker. 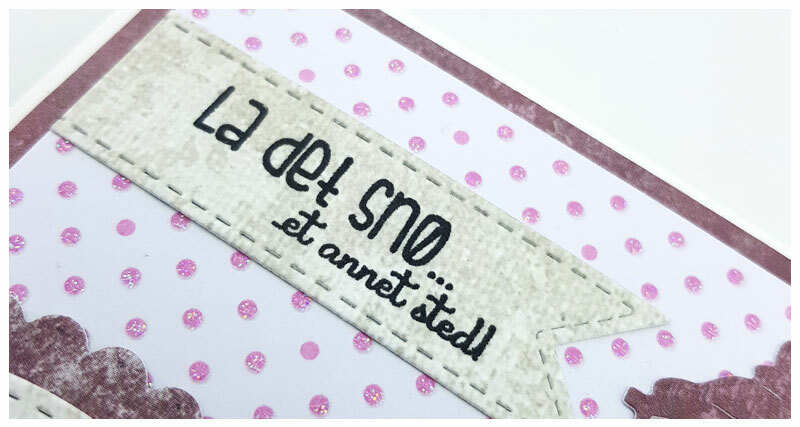 Taggen er fra La-La Land Crafts. 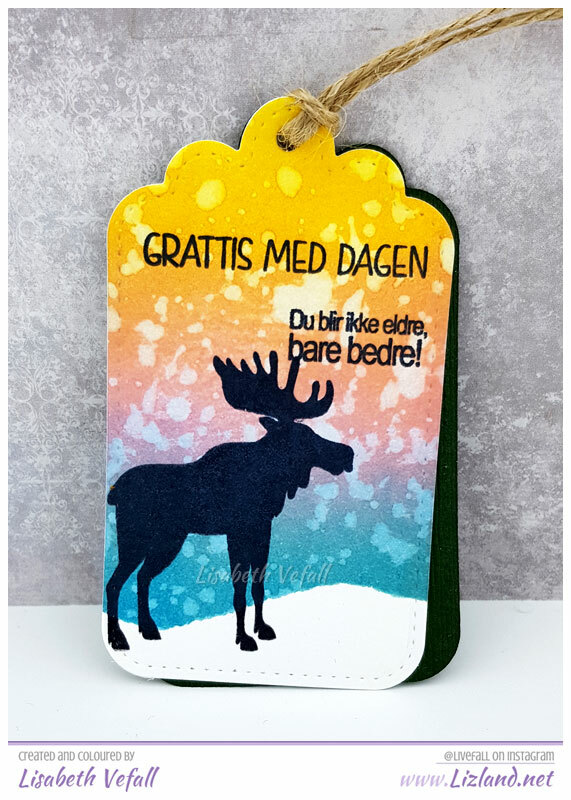 As I am blogging with the Huldra Designstudio stamps, I’ve decided that these posts should also be in Norwegian. Therefore I will write the posts in both languages where the Norwegian part will be in italics. Siden jeg nå legger ut prosjekter med Huldra Designstudio er det naturlig at jeg også skriver norsk i disse innleggene. Derfor vil alt med kursiv skrift i innleggene være på norsk. 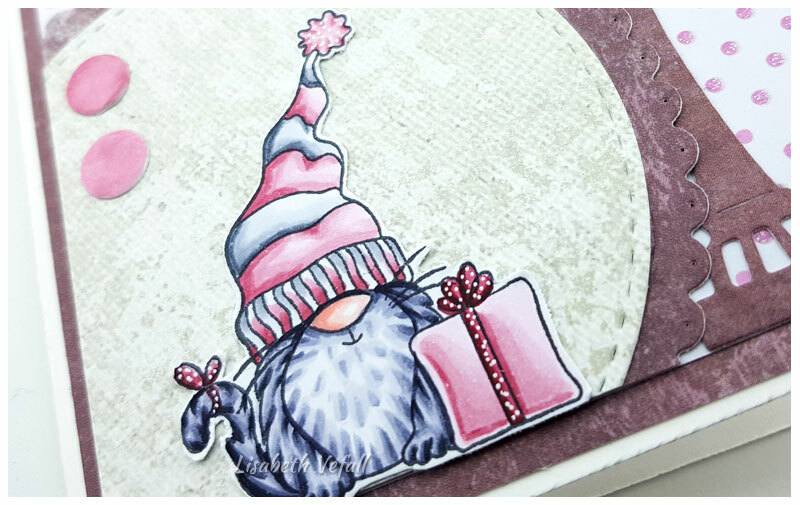 I’ve used the Julekatt og Julehund stamp set and I thin this cat is super adorable! I love his big hat. This stamp seemed perfect for a Christmas tag! I’ve coloured it in with Copics as usual and used various sentiments from two of the other stamp sets on the back side of the tag. The paper is by Maja Design. I love the sentiments. The front here says “Dear Santa… …define naughty”. Perfect! Jeg har brukt stempelplata Julekatt og Julehund fordi jeg synes langnisseluekatten er supersøt! Siden blå er favorittfargen på juleprosjekter ble det et enkelt fargevalg. 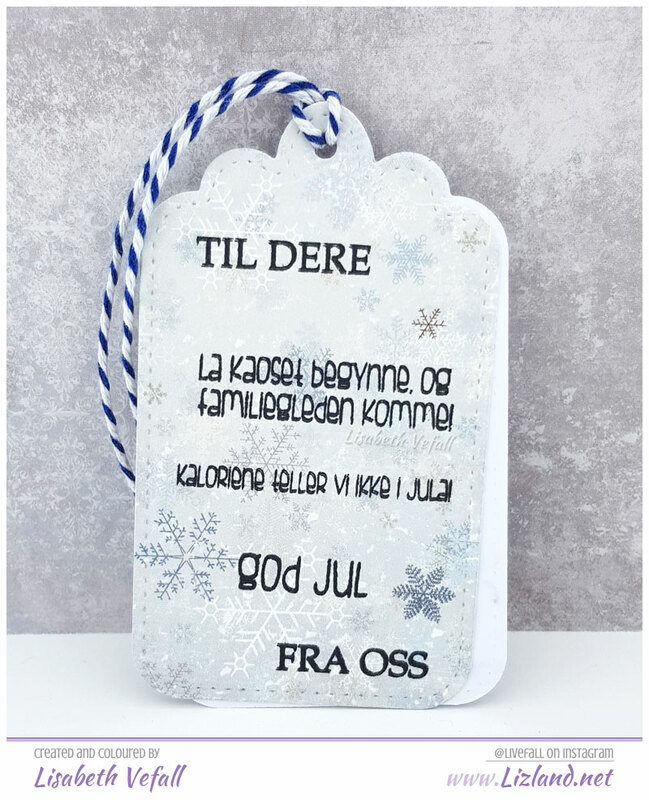 På baksiden har jeg stemplet med tekst fra Juleramp- og Fleksijulstempelplatene på Maja Design papir. Jeg synes teksten på de ulike stempelplatene er herlig og passer meg perfekt! Alt i alt veldig enkel tag og jeg kommer nok til å lage flere fremover. 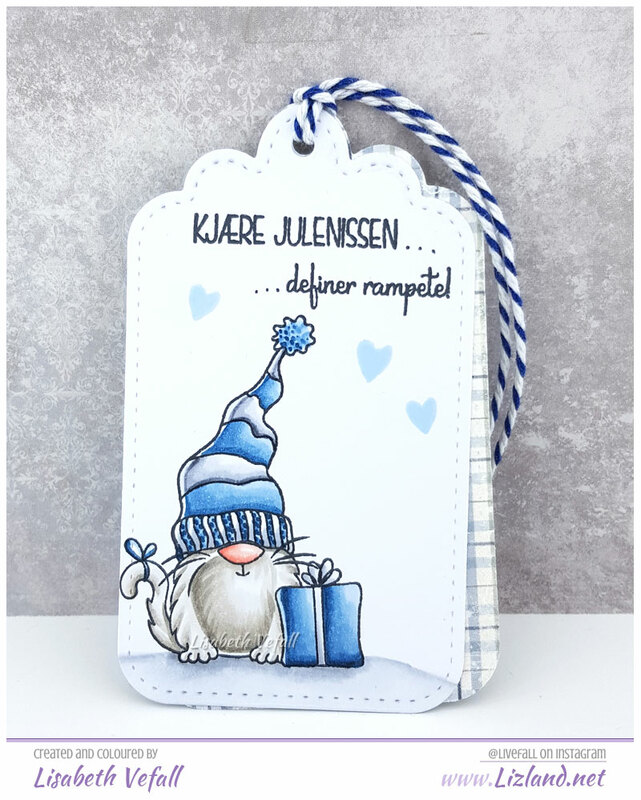 Tag-dien er La-La Land Crafts. Here is the other side of the tag. Her er baksiden av pakkelappen. I’ve coloured up this adorable My Favorite Things stamp to use on a card for a little boy. Of course I had to make it a fun wobble as well! I kept the card very plain again and just added some die cut clouds on blue card stock. 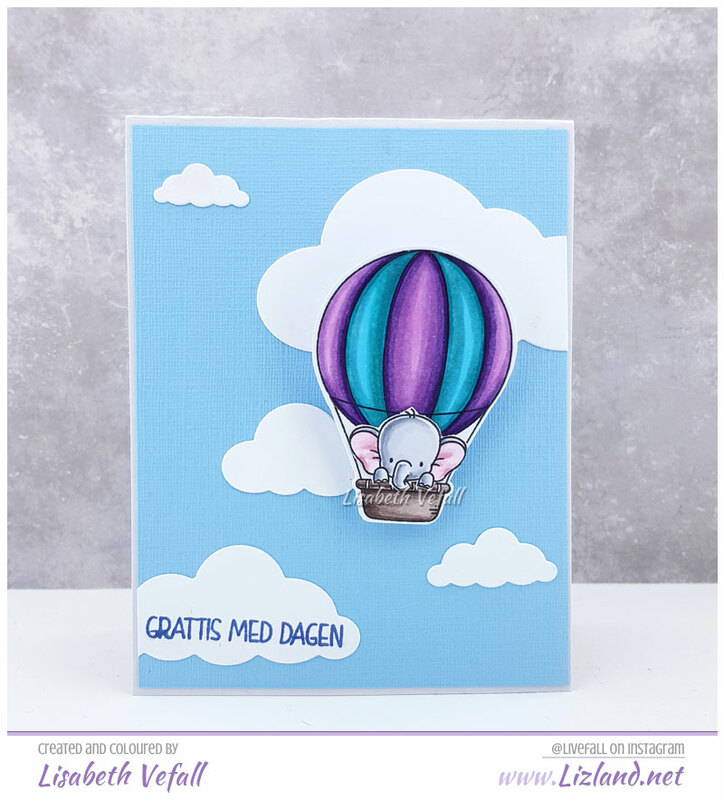 The sentiment stamp is by Huldra Design. Here is a view from the side, as usual. I'm Liz and this is my land of paper crafts, which are mostly cards. All comments are appreciated, and feel free to ask questions there, too. Thanks for stopping by! I have removed the contact form. Should you wish to contact me, please do so through my facebook page, and I will get back to you asap. Sorry for any inconvenience. Bloglovin’ is a portal site where you can follow blogger and non-blogger blogs!